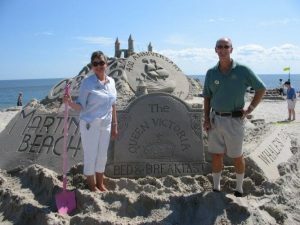 The Queen Victoria is Cape May’s most exclusive bed and breakfast. 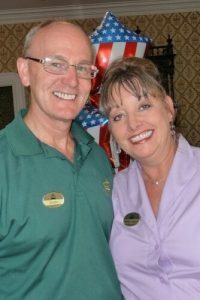 Doug and Anna Marie McMain invite you to experience the charm and Victorian elegance of one of the top rated Cape May hotels in beautiful NJ. They purchased The Queen Victoria® in May of 2004. The purchase of the magnificent property fulfilled their long time dream to own and operate a truly special bed and breakfast inn. Like most innkeepers, Doug and Anna Marie took a circuitous route to their present station in life. They have diverse backgrounds, both of them having enjoyed successful careers in the computer industry. Through the years though, Doug and Anna Marie’s true passion was to own a bed and breakfast inn. Doug was born and raised in Reno, Nevada, where he acquired his love for outdoor sports including skiing, water skiing, hunting and golf. His college years were spent in Missoula Montana earning degrees in Finance and Management. One of the most significant experiences he had in college, in view of his role of innkeeper, was the year he spent managing the kitchen for his forty Sigma Chi fraternity brothers (most of his other fraternity experiences aren’t very relevant to running a bed and breakfast, though they make for a lot of good stories). After college Doug did brief stints as a bonds broker on Wall Street and an insurance salesman in Santa Rosa, California before settling into a 19 year career as a computer systems architect and developer. Anna Marie is a South Jersey native who spent every summer weekend of her youth on the beaches of Ventnor and Margate. Involved in every conceivable organization and club throughout high school, she showed early on her talent for organization, management, and leadership. After earning a degree in Computer Science from Rutgers University, Anna Marie was recruited to work for Ross Perot’s company EDS in Detroit, Michigan. Her exceptional management skills were quickly recognized and she was snatched from the technical development program she was in and vaulted into Management and Marketing at the tender age of 22. Anna Marie evolved into an executive trainer, instructing in such various topics as Quality Assurance, Customer Service and Computer Systems. This led to her founding of Training Works, Inc., which she ran until the purchase of The Queen Victoria. Anna Marie has a passion for antiques, shopping, making crafts, and strolling the beautiful beaches of Cape May. Doug and Anna Marie met and fell in love while working for Ross Perot in Detroit Michigan in the mid-eighties. Their courtship, filled with countless hours of swing dancing, and garden and historic home tours, led to their marriage in 1987. Anna Marie soon “dragged” Doug back home to New Jersey, introducing him to the beautiful Jersey Shore. Before long, the couple purchased their first vintage home in Brigantine, New Jersey, where they picked up valuable skills in the ownership of historic buildings. Not having learned their lesson, they purchased a dilapidated Victorian property in Stratford, New Jersey, which they renovated into the corporate headquarters of their computer training and consulting firm, Training Works, Inc.
Doug and Anna Marie traveled throughout the country over the years, soon discovering the special pleasures that bed and breakfast inns offer the traveler. After their first stay in a bed and breakfast their fate was sealed; it was just a matter of time before they managed to find a way to live in one year-round. When they discovered The Queen Victoria, they knew they had found their future in this Cape May bed and breakfast. This magical place, with it’s wonderful historic design, beautifully restored and maintained rooms, all just steps from the beautiful beaches and historic charms of Cape May, was irresistible to them. Doug and Anna Marie look forward to sharing The Queen Victoria with you and are confident that you will be captivated by the essence of hospitality and comfort of their bed and breakfast inn.